Kaiser Permanente has retrieved its poor reputation from the clenches of the 80’s and now boasts many accolades and awards of recognition for its leadership in healthcare and programs, leaders, and in places to work. Patients no longer complain regularly about mishaps, insurance nightmares and long office waits. Kaiser ranks top in member satisfaction and has invested billions in electronic records and modernizing medical department and administrative equipment for the benefit of practitioners and patients alike. I, myself, am a Kaiser patient, and credit the payer-provider organization for saving the life of both myself and my husband when we were each faced with life-threatening diseases — him with a heart attack in 2009 and me with breast cancer, 5 years ago in 2013. Um, can I get a second opinion? After a second and third opinion, I took the Thursday appointment and had a mastectomy. I would love to tell you how brave I was, how quickly I recovered, and what a poster child I am for how to approach breast cancer as a patient. But the story is the exact opposite. I went in totally uninformed. I went in with cringed eyes and phenomenal stress. There was no time, and no one there to explain it adequately. It was terrifying. I had barely enough time to search Google to determine which kind of breast cancer it was and what my chances were for surviving. I didn’t know how to find information about what the process was going to be, what my options were, what recovery would be like, or how this would impact me or my family. I was completely in the dark. The whole process was so quick, there was no time to think about the decisions I was making. We were given pamphlets and a page with checkboxes and if we needed more time to decide, we were left alone in a room to discuss it (and look things up on Google), but I mean, Jesus. Both breasts, just one? Reconstruction or not? Saline or silicone? Tummy tuck add-on (for real, yes, no charge)? Is 11 am good for you? “You’re so brave,” people kept saying. That’s a nice thought. I want to be someone that others can look up to, someone who weathered the storm with a stiff upper lip, but I’m afraid I let everyone down on that count. I was in a panic most of the time, I cried after sometimes in confusion about what was happening to my body, sometimes just out of fear of what would happen next. I was a total nuisance to the nurses and doctors, calling on them constantly with questions and concerns and escalating my issues to their supervisors when I didn’t like the answers or treatment I received. When I got home, I couldn’t stand to look at the scars so I showered in the dark for months. The PTSD from the surgery and procedures afterward did not fade really. I didn’t want to be touched. My self-confidence started to suffer. My very understanding husband was doing whatever he could to support me in my healing, but I kept falling into despair and self-loathing, I didn’t feel whole anymore. Year after year I would watch the breast cancer walk on TV and wonder why I hadn’t bounced back so effortlessly they way the spokeswomen had, in their bright pink t-shirts with ribbons pinned to them. I looked for breast cancer survivor support groups and found two within an hour’s drive. One was for young women under 40. I was 43. The other required that you leave a voice message so I did and no one called me back. Statistically speaking, there is a 3% chance that I will have cancer in my right breast in the future. Doesn’t seem like a lot but….the chances of winning the National Lottery are 1 in 45,057,474. And I’ve played that, probably, 20 times in my lifetime. 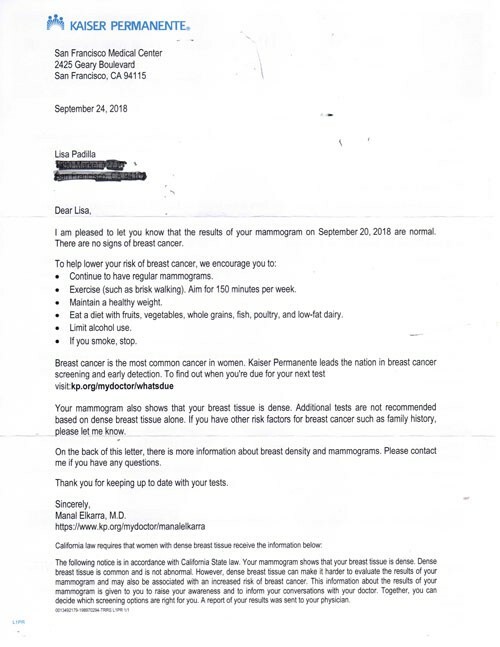 Every year since the surgery, when I receive a call from my Kaiser nurse telling me it is time for my annual mammogram and women’s exam, an anvil drops into my stomach. Time to play again. I schedule a day that I have no meetings because I know that I will be so psychologically and physically triggered that I shouldn’t plan anything else. I usually plan to get cupcakes or ice cream afterward so I have something to look forward to and reward myself (something leftover that my mother used to do for me, I still do for myself). We promised you the technology is evolving and this year Oculus came out with a phone-free, tether-free headset with a nice resolution that runs apps that ran on the Samsung Gear VR, which required an expensive phone. I’ve been singing its praises for months, suggesting patients use it in hospital beds, waiting rooms, and doctor’s offices. 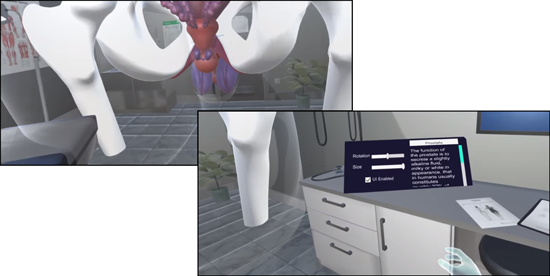 We even built an Oculus Go application called the Prostate Procedure Guide for patient education and anxiety reduction. I imagine you’re beginning to see some of the origins of our motivations. At previous exams, I premedicated with anti-anxiety medications and/or recreational drugs. Yes, I’m (not) the portrait of strength and fearlessness, as mentioned. Yet these solutions somehow made me more sensitive to the experience in many ways and that wasn’t productive. This year I am convinced by the extensive research and people I have witnessed and their healing experiences with VR. 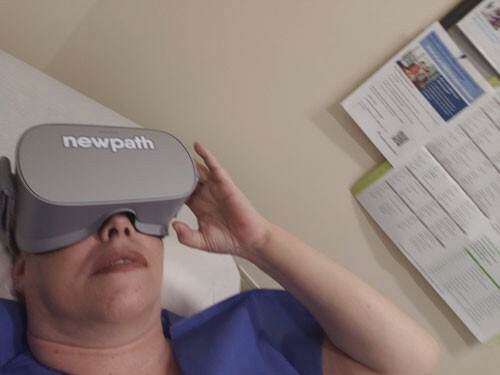 I have seen and reviewed hundreds of wellness applications on RenewVR and have read hundreds of articles and research papers on the mental health benefits of VR. 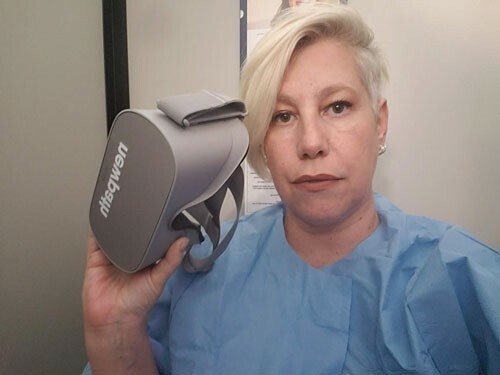 So I decided to load up my Oculus Go and take it to my appointment. First was my mammogram. 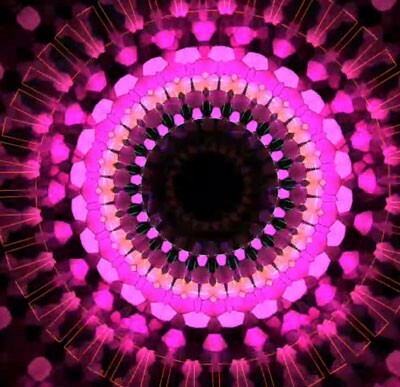 I sat in the waiting room and started an app called Kaleidorium. I paired the app with my Spotify playlist I use while I make art made up of some current favorite songs (Hearts and Bones, Paul Simon; Let You Love Me, Rita Ora; Wild Things, Alessia Cara; What About Us, Pink) and I watched the beautiful colors change and fly by. I hear the nurse call my name and forget that I was supposed to be worrying about this procedure. I step into the room with the radiologist to perform the mammogram. She does her thing. I resist the urge to look at the screen but wait for her response. She sees these all day, she knows what’s up. She says it looks good but they’ll contact me in a few days to confirm. I notice that overall I am not so freaked out. Now it’s time for my pelvic exam. Wait, you are wondering, are we not past the 1700's? 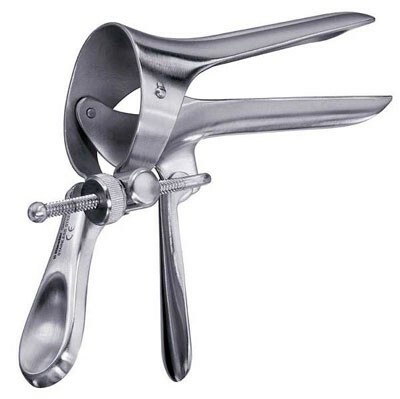 Why yes, that’s true, but we still use steam-punk, friggin’ ice-cold, torture-looking devices and this is just so the doctor can get inside our lady bits, I’m not going to go into what they do once they get in there. 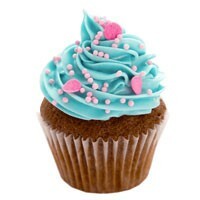 Think cupcakes. Think cupcakes. Think cupcakes. This time I put on an app called Azul. It’s a meditation and mindfulness app that helps you focus. Instead of looking at the foam panels in the office ceiling and fluorescent light bulbs, I selected a scene, a field with birds in the sky, and I selected the music and laid back. I watched the birds fly in circles. Before I knew it, she was done. It was that fast. 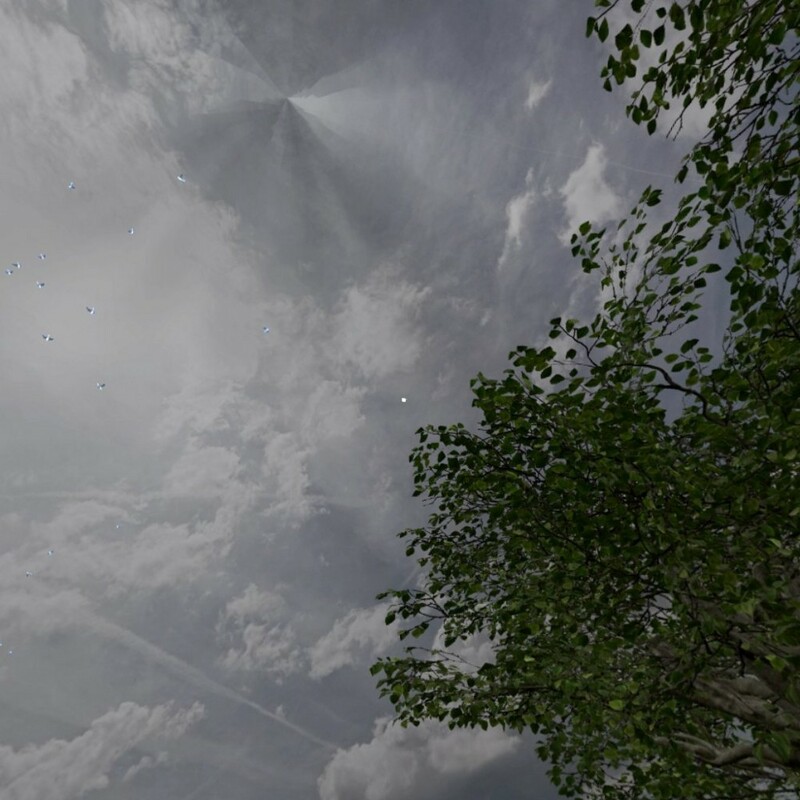 Time flies when you are in VR, people often recount that they thought less time had gone by while they were using it. But in this case, shorter perceived time, no pain, very little discomfort, and no PTSD as I usually have had after this procedure. As the CEO of NewPathVR, I spend my days evangelizing the psychological benefits of virtual reality. Taking it into my own life is a natural step but one that surpassed my expectations still. I didn’t actually need those cupcakes or meds after all. Virtual reality is a powerful state change tool and remains the most evolutionary force to meet so many industries in years, particularly emotional wellness. The great news is that I received a clean bill of health. 5 years cancer free! I recommend the Oculus Go this winter for you, your kids, your friends, and family, believe me, you’ll find uses for it. This spring, you’ll want to grab the Oculus Quest too, for full room-scale VR and higher resolution apps. Here are links to the apps I used but there are hundreds more on renewvr.com.